Americans for Legal Immigration PAC is asking a network of seasoned Amnesty legislation fighters to focus their efforts on shutting down the Secure America First Amnesty bill (HR 4760), which is being backed by notorious Republican Amnesty supporting Representatives Bob Goodlatte and Michael McCaul, through calls to Congress and a new wave of endorsements for GOP primary challengers. 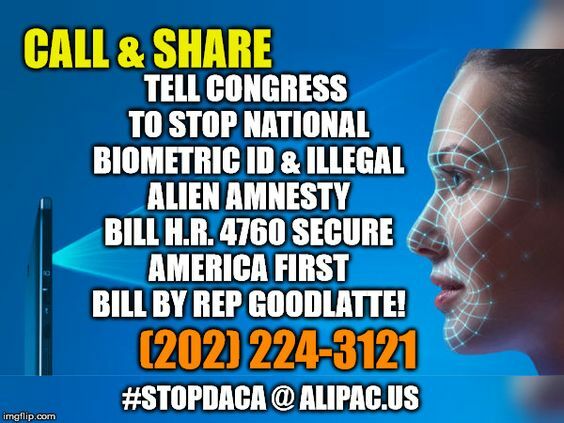 Representatives Goodlatte and McCaul are on ALIPAC's Cantor List for targeting and removal from office in GOP primaries due to their documented support for Amnesty for illegal aliens like Rep. Eric Cantor who was defeated over this issue. HR 4760 would change America's existing immigration laws to accommodate more than 700,000 illegal immigrants currently being given immunity from U.S. laws through the overtly illegal and unconstitutional DACA program created through memos by Obama and sustained through the Presidential administration of Donald Trump, who has broken his promise to end the program on this first day in office. HR 4760 promises conservatives an end to chain migration, visa lotteries, and a border wall in exchange for DACA Amnesty which will give work permits, ID, and immunity from existing immigration laws while attempting to prevent enrollees from achieving citizenship and voting rights. Yet it is likely activist judges will award full citizenship because Congress is prohibited from forming second class tiers of citizenship through legislation. Also, there is an Orwellian Big Brother biometric national ID card mandate hidden in the 400 pages of HR 4760, which forces all Americans to submit to unprecedented surveillance state tracking technologies alongside the illegal immigrants put into the same system. In 48 hours, ALIPAC will begin a new wave of GOP primary endorsements which will force Republican incumbents in Washington, DC, to turn their attention away from DC-based groups pushing Amnesty to their likely GOP primary voters back home who overwhelmingly oppose DACA Amnesty bills 2 to 1 nationally and 4 to 1 in many GOP House districts! "HR 4760 promises American conservatives everything they want to hear to get the spoonful of Amnesty poison to go down. If it passes, we can expect the Amnesty to happen at levels much larger than what the bill calls for and most of the promises of stronger enforcement and legal immigration level reductions to never materialize," explained William Gheen, President of ALIPAC. "Our current immigration and border laws are meaningless because they are sabotaged by DC special interests, global corporations, Goldman Sachs, the Koch Brothers, and billionaires like Bloomberg and Soros. The Goodlatte/McCaul Amnesty bill gives illegal immigrants and these power groups what they want, and that is why we will fight to stop HR 4760 and continue our pursuit of Constitutional governance in America where the Executive Branch does its job and enforces the laws we have instead of seeking ways to accommodate millions of illegals. This week we will utilize GOP primaries to shut down Amnesty bills in DC!" The battle over HR 4760 is unusual in the fact that groups which previously opposed Amnesty for illegals such as NumbersUSA and Californians for Population Stabilization (CAPS) have flipped their alignment to support Amnesty through the Goodlatte bill, leading ALIPAC to end support for NumbersUSA. While NumbersUSA is a highly influential organization in Washington, DC, their position in support of HR 4760 runs counter to the 67% of likely GOP primary voters found in the recent ALIPAC / Barometer Polling survey (View) who want America's existing immigration laws enforced instead of any change to accommodate DACA illegal immigrants with Amnesty. ALIPAC activists are being deployed today to call GOP representatives in Congress to oppose Amnesty bill HR 4760 after last week's successful battle stopping three Amnesty bills in the US Senate! Last edited by ALIPAC; 03-12-2018 at 11:09 AM. KILL THE BILLS!! KILL ALL OF THEM!! VOTE REPUBLICAN IN 2018 so we can get a real majority in both chambers and then in 2019 pass the bills we want and need without any compromise, negotiation, amnesty or "deals" that harm our own interests. At this point, waiting one more year for the big solutions we need to fix our country won't matter. HOLD THE LINE!! AMERICA FIRST!! LET DACA EXPIRE MARCH 5TH AND DEPORT THEM ALL! NO SPECIAL RULES FOR ILLEGAL ALIEN TRESPASSERS NO MATTER WHAT AGE THEY ILLEGALLY CROSSED OUR BORDER! ENFORCE OUR LAWS AND DEPORT THEM ALL. Is it 4750 or 4760? The OP has both numbers. Not sure how 4750 got into this release. Thanks for the heads up team... will adjust.